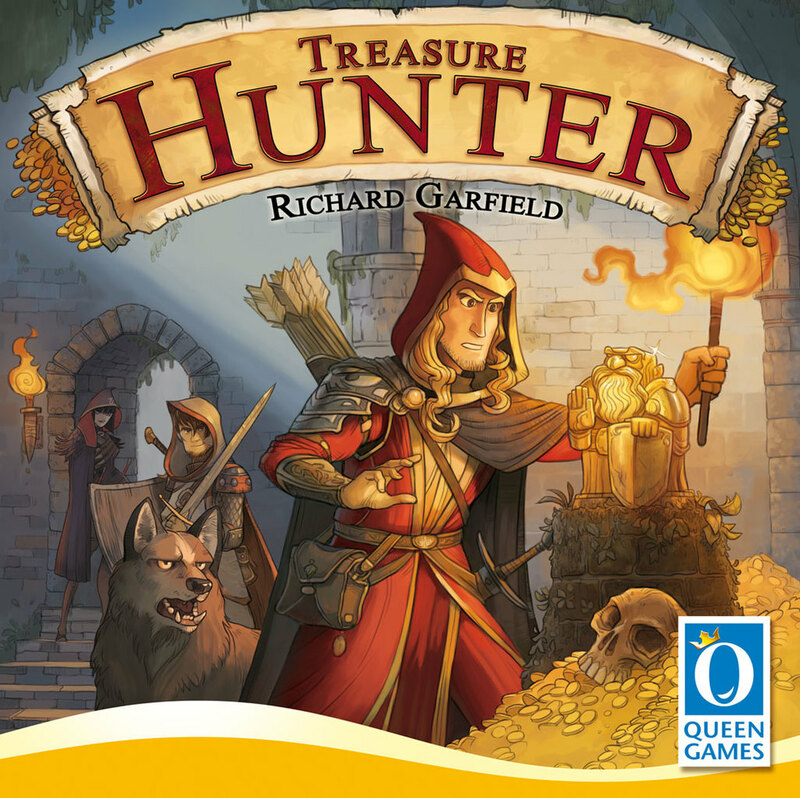 Treasure Hunter is a quick drafting card game that I first had a chance to play at GenCon 2015. It is designed by Richard Garfield, the designer of Magic: The Gathering, one of my all-time favorite games. In the game, players travel to three different locations and attempt to collect treasures and scrolls. Players cannot simply concentrate on winning treasure though as there are goblins which will try to steal some of your wealth while you’re away on your expeditions. The game is played over 5 rounds – helpfully marked by a track on the board. This board also shows the three different treasure locations, each location with a space for a hard-to-find treasure as well as an easy-to-find treasure. There are also spaces on the boards for three goblins. Each player starts with 15 coins. At the start of the game, the treasure tiles are shuffled and placed into two stacks. Then, at the start of each round, a single tile is placed on each side of the three treasure areas. These tiles are mostly artifacts, worth anywhere from -8 to +20 coins. There are also a bunch of yellow scroll tiles which each give a one-time-use special ability and a few gray scroll tiles which each give a different end game scoring bonus. The tiles in each round are placed face up on the board so that all players can see what they are fighting for. There are three phases in each of the five rounds. Phase One: Assemble your hand. The deck of cards is shuffled. It is comprised of adventurer cards (numbered 1 to 12 in each of the three treasure area colors), coin cards (worth 1, 2, or 3 coins), watchdog cards, and some special action cards. Each player is dealt a hand of 9 cards from the deck. The player examines his hand, chooses one card that goes face down in front of him, and then the remaining cards are passed to his neighbor – the direction of passing is shown on the turn order track. This draft continues until all players have placed 9 cards face down in front of them. Phase Two: Play your cards. The first thing to do is to collect treasures. You resolve each of the three treasure areas (from top to bottom) in the same way. All players must reveal ALL cards they have in their hand for the particular area and sum up the numbers on those cards. Then, starting with the dealer of the round, players can choose to play any action cards that they have collected. These cards could increase or decrease their own total score or cancel one of the cards in play. Once all players have played all the action cards they want, final sums are calculated. The player with the highest total collects the MAX treasure tile on the left and the player with the lowest total collects the MIN treasure on the right. If you did not have any cards or if your final sum is zero or less, you are not eligible to collect a treasure tile. It could happen that a single player collects both treasures. If there is a tie, the tied player with the single highest card wins the tie (whether this be for MAX or MIN). All captured treasures are kept face up on the table. In the unlikely event that no player has a positive total, the treasures at that site are simply discarded. The same procedure is done for the Tangled Jungle and then finally for the Lava Cave so that all of the treasure tiles are awarded. Then, you must deal with the goblins. Remember at the beginning of the round, three Goblin tiles were placed face up on the board. Each one of these tiles has a paw strength value on it. Players reveal their Watchdog cards in their hand (as well as any possible action cards that deal with Goblins) to determine their watchdog strength. If the player’s strength is at least equal to the number printed on the goblin tile, nothing happens. If it is less than the goblin tile, a number of coins are stolen by the goblin – the player puts the appointed number of coins onto the tile. Each of the three Goblin tiles are evaluated separately. It could turn out that you defeat some goblins while lose to others. Once all players have resolved their battles with the Goblins, the players compare their Watchdog strength with each other. The player with the highest Watchdog total has the ability to collect any Goblin tiles which they were able to defeat. They also collect any of the coins which had been placed on those Goblins. Finally, players play any remaining cards (these should only be coin cards), and collect a number of coins from the bank equal to the coins shown on the card. As I mentioned earlier, some of the treasure tiles are Yellow scrolls – each of these can be used one-time-only to collect coins from the bank. These tiles always refer back to the cards played by that player in this round. For instance, the Packmaster cards offer 1, 2 or 3 coins for each Watchdog card played while the Strong Team cards offer 1, 2, or 3 coins for each card played of the specified color. Once you use your tile, you collect your coins and discard the tile to the box. The game continues in this fashion for five total rounds. 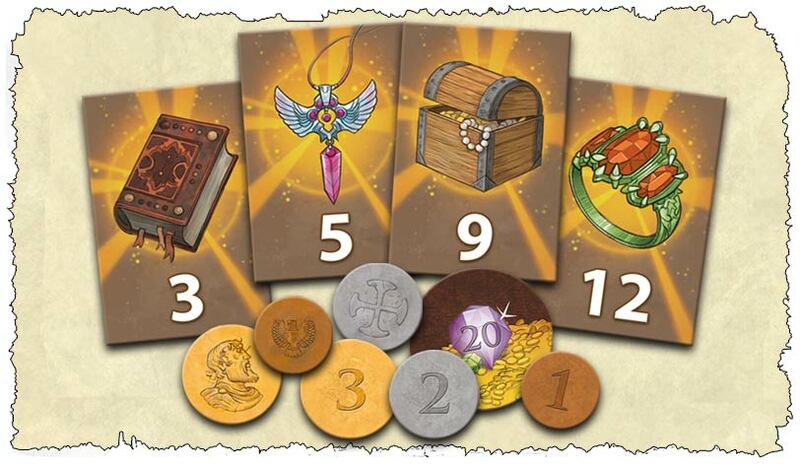 In each round, new treasure tiles are dealt out on each side of the three areas. In the fifth round, any yellow treasure tiles are discarded and replaced with an artifact or gray scroll tie. 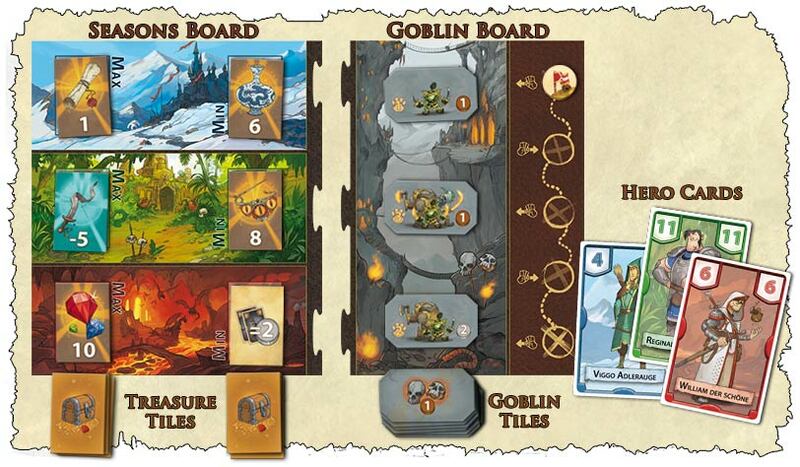 Three new goblin tiles are also revealed each round. The deck of cards is shuffled, and each player starts with a new hand of 9 cards. The direction of passing in any particular round follows the direction from the round order track. The player with the highest total wins. There is no tiebreaker. Treasure Hunter is a very straightforward drafting game – simple enough that it could serve as a good introduction to the genre. In each round, you need to see what the treasures are to figure out what you want to collect (or not collect). This may help you decide which cards you wish to hold onto in the drafting. If you have collected yellow scrolls in a previous round, the potential for bonus scoring may also direct your card collection. Don’t forget about the watchdogs in the drafting phase– there aren’t that many of them, and it’s unlikely that you’ll see them twice. You need to weigh the costs/benefits of collecting them or not. The payoff for the having the most dogs can be really good – when you take in the coins on the back of the goblin cards as well as the payments made by all the other players who could not fight off the goblins. The card playing phase is mostly simple as you simply reveal all the numbered cards for each color as they are resolved. There can be a little bit of conflict in the action cards, and we just go around clockwise from the start player until everyone passes. Choosing when and how to play your action cards may be the most “complicated” part of the game, but even the youngest of gamers that we have played this with have been able to figure it out. The game plays quickly, and once players were familiar with the game, our 4p games come in closer to 30 minutes. Each of the five rounds in the game are essentially identical with the exception that some players may have a slightly different focus due to previously collected scrolls. But, in this game, the repetition is not a bad thing, it just gives the players enough time to overcome a bad round or to possibly allow a player to implement a slow but steady strategy. The fact that any particular game will not use all the treasure tiles also makes the scoring in each game a little bit more uncertain. On the whole, I would probably prefer a drafting game with a little bit more complexity, but this has proven to be good with younger gamers this holiday season. Dan Blum (1 play): I really couldn’t see anything appealing about this. In most pure drafting games you select something and then everyone reveals their selections before you have to make another selection; 7 Wonders is a good example, as is Sushi Go on the simpler side. There are games that don’t work like that, of course. Fairy Tale is a good example: you have to draft several cards before any are played. However, there are multiple rounds of drafting and the played cards persist between rounds, so you get more and more information as the game goes on, plus almost all the cards interact with each other. In Treasure Hunter things work differently: you have to draft all of your cards each round with no information on what other players are selecting (other than which cards are missing the second time you see each hand), the cards don’t persist between rounds, and hardly any of the cards interact. So the treasure-gathering part (i.e., the part that’s supposed to be interesting) is mostly a crapshoot. I ended up doing quite well the one time I played by realizing how useless the colored cards were (in round 3, I think) and just collecting dog and money cards, only taking anything else when forced to. Had I started doing this earlier I would have easily won the game. Andrea “Liga” Ligabue (1 play): I usually like Richard Garfield’s games. There is always something special that thrills me and that’s happened also with Treasure Hunter. The game is really simple and it is nothing more than a sequence of drafts but how the card combine with the scorings is great and the informations you have (your cards and what you are getting from other players) are enough to plan a little strategy. Of course it is not a deep strategic game but it works and it is fun.